On May 6th voters will be offered a dismal choice of cuts, sackings and wars by politicians tainted by corruption, duck houses and other expenses fiddling. All three Westminster parties are in a race to see who can make the deepest cuts while the SNP wring their hands and blame London. They all recommend cuts to vital public services which will hit the most vulnerable hardest and directly threaten the jobs of 100,000 Scottish workers. 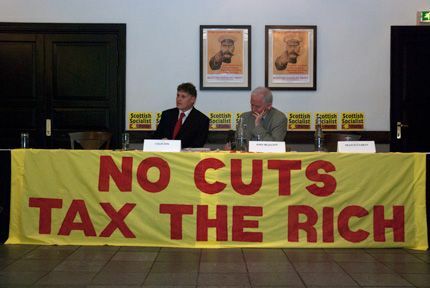 In contrast the unequivocal message from the Scottish Socialist Party is that there is an alternative which avoids cuts and insists instead that the greedy pay for the disaster they created, that also ends our involvement in the Afghan war and offers jobs and justice not misery and war. This belief is reflected in our programme for a Scotland which aims to meet peoples’ needs, not pander to the rich, for people not profit. 100,000 jobs Are directly threatened by the cuts promised by the Westminster parties and vital services for our most vulnerable citizens will go. We say that faced with such a threat words are not enough—action is needed. Scotland needs nothing less than a resistance movement of mass peaceful protest on the scale of that which defeated the poll tax. We will bring all the experience of the SSP to build such a movement. The spectre of mass unemployment has returned twenty years after Margaret Thatcher was ejected from office. 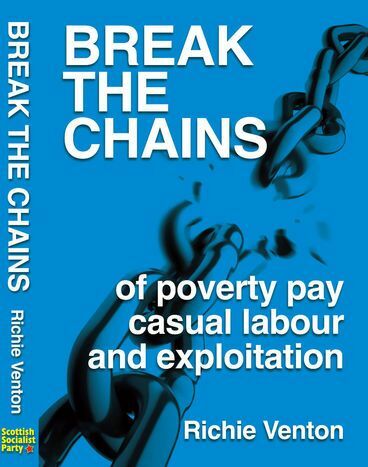 Many communities in Scotland are still suffering from the legacy of the 1980s with the poverty, heroin addiction, alcohol abuse and crime that goes with this chronic joblessness. Today the SSP says: ‘Mass unemployment No More’. Instead of slashing Scotland’s budget, the SSP will fight for emergency funding to protect our young people from becoming another wasted generation. This is a senseless military occupation which damages Britain’s international reputation and does nothing to make the world a safer place. We are occupying a country that doesn’t want us to be there. More than 50,000 innocent Afghan civilians have been killed. Some 280 British soldiers have also died. All the polling evidence suggests that 70% of the population here want our armed services withdrawn. The Scottish Socialist Party gives voice to that majority. In just 12 months Westminster has gone from ‘the mother of parliaments’ to ‘the mother of all corruption’. The public has watched open mouthed as MPs attempt to justify obscene expenses claims which would get an ordinary worker sacked. MP’s have repeatedly shown how they are all out of touch with the people they pretend to represent. For the SSP the answer is simple and it is to end the circumstances where becoming an MP brings a huge salary and expenses. We have long argued that MP’s should live on the wage of those they represent. Our MSPs did just that at Holyrood thus keeping them in touch with the real lives of voters. We will work with other pro-independence parties to deliver a resounding referendum YES vote. Beyond that, we stand for an independent socialist republic where the wealth is fairly distributed; where protection of the environment is paramount. Such a republic would prioritise the needs of people over profit and our environment over the greed of profiteers. All citizens would be equal irrespective of gender, race, religion or sexuality in a country where the economy is no longer driven by greed and profit.